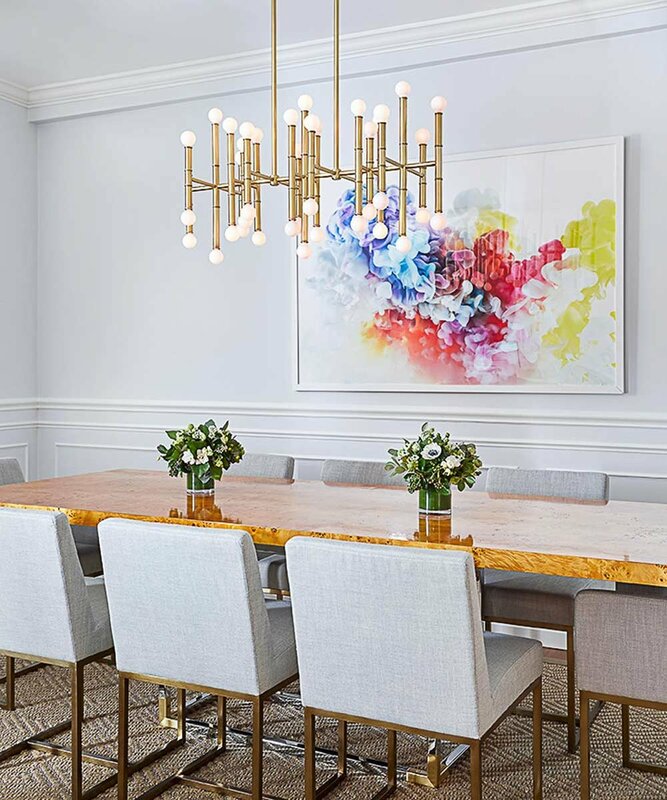 Jessica Kenyon abstract art in dining room designed by Christina Croll Interiors. Photograph by Emily Gilbert. I'm so proud of my little sister, Christina. *Drum Roll* She recently launched her own interior design company, and she is killing it! Christina designed this gorgeous interior and incorporated my Cloud 9 print into her design. It's so cool to see our creative work merge in this space! I'm constantly learning from Christina, and I feel so lucky that we work in industries that overlap. It's awesome to have another entrepreneur in the family. When I finally buy my first house, I'm going straight to her for help. Here are a few tips when sizing art for a dining room: The center of a single piece of art should be 55″ – 60″ from the floor. This places the artwork at eye level. The most common mistake art buyers make is purchasing a piece that is too small. When picking art for any room, bigger is better because it makes spaces appear larger.